I’m thinking of becoming a zombie. My concern is running into competition with local cannibals. 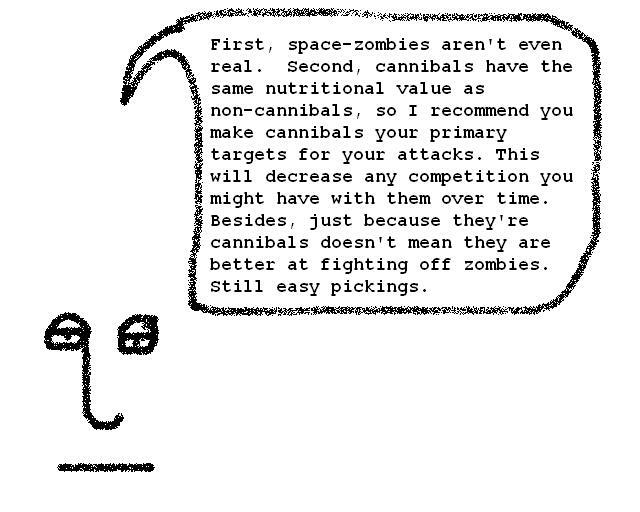 Should I be a space-zombie or just attempt to peacefully coexist with the cannibals? Help me Obi Wan Quoknow-B, you’re my only hope! Thanks, Quo! You’re a real after-life saver! I kinda like the idea of becoming the first space-zombie, but I really should stay around here. Maybe I can lurk around the hospital exits and get the people being wheeled out in chairs. Low-hangin fruit! If you really want to be a zombie, you’re going to have to lose some of that initiative. I’m trying to plan for this like it’s my retirement. Very responsible of you. Most people just kind of find themselves zombies without any plan or direction. Not you.